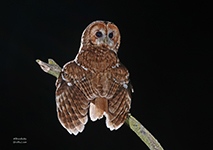 Certainly one of the most recognisable sounds in the natural world the tawny owls iconic twit-twoo is more often heard than the bird seen. 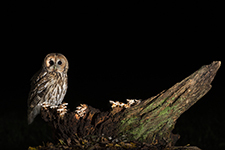 The resident pair come year round to our ‘wired hide’ and is quite the experience even for non-photographers. 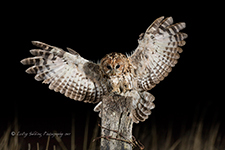 The hides LED lighting system run from a 12v solar panel illuminates the whole area - this aids in seeing/focus the owls arrive at the changeable perches and as the owls are coming into a well lit area they pay no attention to the flash* we use to expose the scene. * Flashes are available to hire and come with tuition. Reserve a set at time of booking. 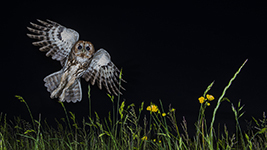 ** As this species is completely nocturnal we recommend that you remain in the hide until the early hours to be sure you see all of the evenings activity.